While I've been trying to stick to a strict brush cleaning routine, the effort is sort of lost when the products themselves aren't clean too. While I'm usually quite good at getting rid of out of date products, I do have a few limited editions that I can’t seem to part with. In order to make my products last longer and free from as much bacteria as possible, I've been introduced to the Pro Hygiene Collection’s Makeup Antibacterial Spray which safely eliminates 99.99% of bacteria from my makeup and beauty tools. Cleaning your makeup might not be a new thing for makeup artists (I should hope it’s not!) but it’s relatively new for the average beauty consumer. The way the spray works is that you simply hold the bottle 30cm from the product of your choice, spray once then wait up to 60-80 seconds before using it again. What I like about the spray is that it can be used on so many types of makeup including: creams, gels, powders, lipsticks, pencils, makeup tools and accessories so basically one spray fits all. I first tried it on my MAC Mineralise Skin Finish, sprayed once and within a minute or two, it was completely back to normal and ready to be used. Although you can't really tell if it works on application, it has been “independently laboratory tested and conforms to European Standard BS EN1276:2009 for the bacterial activity of chemical disinfectants and antiseptics” if that helps. I don't doubt there’s probably a cheaper alternative but personally I'd rather have a product which gives me peace of mind that it won't ruin my makeup or alter the formula in any way. I also really like how large the bottle is and the pump sprays like a mist so it doesn't dispense too much product at once. It doesn't give any recommendation on how often to use the spray but personally I'd use it more often on products I use on a daily basis or if a friend wants to use one of my products. It might even be good to have if you plan to have or buy from a few blog sales. I would really recommend this antibacterial spray, particularly if you have problematic skin, a large collection of products or if you’re products are going to be used by more than one person. 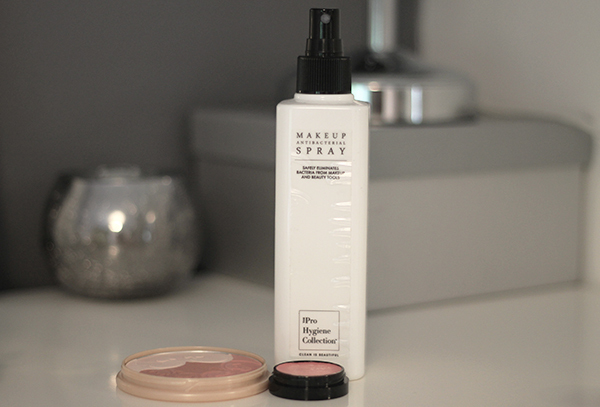 If you're interested in purchasing the Makeup Antibacterial Spray you can get it for £15 from CultBeauty.co.uk.